Little Miss Clingy persists, but we'll cut her some slack this week since she's teething again. Yup... my little almost 9 month old is going to have SIX teeth! They're two more upper teeth which just makes her bites much more powerful. Yeah, about the biting. One night while we were playing around on the bed, she bit me three times in the arms and chest. And they hurt! We are trying to enforce "NO" much more with her, but it's still not quite registering. Persistance, right? She continues to jabber and has started to say "ra" and "bob" repeatedly. She still says "dada" all the time, but rarely "mama." I guess she just has to be in the mood for that one. (Breaks my heart!) I just love her little voice. 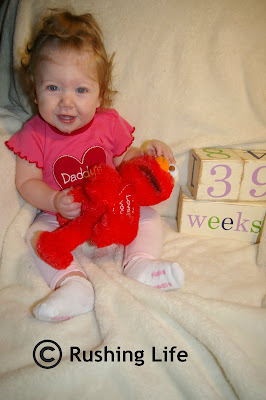 I cannot wait until she can start saying real words! We have been working with an actual sleep/eat schedule that is going pretty well now for a few weeks. Or at least on the weekend. She's on a totally different nap schedule at school, which I just roll with. On the weekends, she usually wakes up about 7:30am and has a bottle and nurses that on and off for about an hour. (She's not a big breakfast eater, apparently.) About 9:30am, she wants a bottle and an hour long nap. She has lunch then between 11am and noon and another bottle for a snack about 3pm. She takes another hour long nap then (sometimes longer, which I totally love) and she snacks on either some fruit or bread or whatever about 5pm. She has dinner about 7pm and another big 8 ounce bottle right before bed about 8:30pm or so. It may not work for everyone, but it works for us. And that's all that matters! This week too, she has been a little dancer. She bounces up and down and waves her hands to music. Or when she wants something, apparently. Because she was busting out all the moves when Puff had a biscuit from KFC that he was feeding her. It was like it was crack! She was dancing and clawing at him to get more, She ate the entire thing! I can't blame her...KFC biscuits are yummy! !